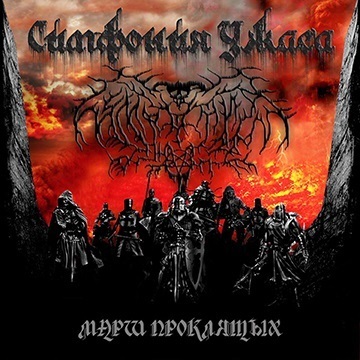 Symphoniya Uzhasa(Rus) or Symphony of Horror(Eng)Kazakhstan's band, with lyrics in Russian, which plays in the genres of Experimental Symphonic Black Metal.The band was formed on 27 December 2008. in Almaty. staff of six people. Alexander Timchenko (Guitar), Gregory Bayboshkin (Guitar / backing vocals), Philip Yashchenko (keys), Ivan Yunev (Vocals), Alexey Napryaglo (Bass Guitar), Alexander Lebedev (Drums)! Before you come to the Symphony of Horror, each of the participants had little experience in other beginners teams did not take place. The band's name was suggested by Philip Yaschenko keyboard, a few days before the debut performance. And no matter how it may seem pathetic for such areas as Black Metal, the time at the moment is simply not there. It was decided to leave the name, in which case, change the name after the opening, but later it never happened. The first performance took place on Walpurgis Night, April 30 of 2009. At that time, the city of Almaty has rarely held event on heavy music, so covers on bands like Satyricon, Emperor, Dimmu Borgir and Craddle of Filth, were particularly well received by the local audience. In January 2010, the first demo was recorded for the song "Agony" in the recording studio "st.Shapito". At the end of the next few concerts left the band soloist, Ivan Yunev (for domestic reasons) and ideological differences keyboardist Philippe Yaschenko. For a while the band performs without keys intending to change the direction of Death Metal, but against this idea persistently advocates Gregory Bayboshkin and find the keyboard player Ilya Livshits. After the debut of the new keyboard player, left the band drummer Alexander Lebedev, explaining his departure lack of time on domestic violence and the fact that he sees no point seized of the direction of music in the country. New drummer Vladimir Lobanov, accidentally finds Gregory Bayboshkin, He has to work hard to catch up with the team in technical terms. August 20, 2011, the group began working on recording a full-length album, in the recording studio "st.Shapito" with the participation of the sound engineer Dmitry Podolyuka. The band members decided to go beyond the traditional black metal and go in experimentation. During work in the studio, comes the understanding that the gang need a second keyboard player, because keyboards have become richer, in connection with this decision, to take another musician Ildar Abdulvagapova (keys2). In parallel with the work in the studio the band goes into small tour, debuting new members. In general, writing the album in a household abstraction, it took a long time, and so after 16 months of frantic madness, what was happening in the studio recording "St. Shapito", was released, full-length debut album, "The March of the Damned"! (21.12.12). Since this work was released on their own, the material does not have wide distribution, but, as some close students from countries such as Greece, Iceland, France, Spain, left quite good reviews, and wished to have at the original CD "March of the Damned." Nevertheless, the album continues to spread and find its audience.